Baader Hyperion Eyepieces are Modular, dual fit and offer an impressive 68 degree widefield field of view. We stock the whole range of Baader Hyperion Eyepieces. 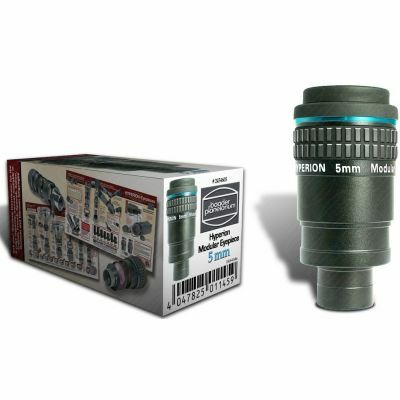 Modular dual 31.7mm/50.8mm 68 degree widefield eyepieces that performs as well as eyepieces three times its price. Each Hyperion is supplied with a soft leather storage bag for safe keeping, and two dust caps for storing the eyepiece with either the rubber eyeguard either folded up or down! The Hyperion design has has both a 31.7mm (1 1/4") and 50.8mm (2") barrel for fitting into either size focuser or diagonal. Both barrel sizes have a safety groove for safe use in your telescope. Each Hyperion features Baader's PHANTOM-GROUP Multi-Coatings for maximum light transmission and the ultimate in image contrast. There are two photographic threads on each Hyperion, M43 and SP54. These threads are located under the rubber eye-cap, or rather beneath the thread protecting ring which is made of high-quality and aging-resistant silicone rubber. A variety of focal lengths can be obtained from each Hyperion. A second focal length is easily acheived by removing the first group of lenses. Additional FL can then be acheived by purchasing a 14mm Fine Tuning Ring (FTR), 28mm FTR, combining the 14mm and 28mm FTR, and with 2" Baader Filter (height 8mm). The Hyperion can be combined with a Baader adaptor ring to mount a camera directly onto the eyepiece. In addition, there are a large number of Baader adapting rings and fittings to make the Hyperion suitable for (almost) every task in astronomical - and nature - photography as a high quality projection optic or as a tele-extender. The Hyperions work as well for photographic applications as they do for visual use.